Do you like my brothers festive house? My sister-in-law is pretty much a creative genius. 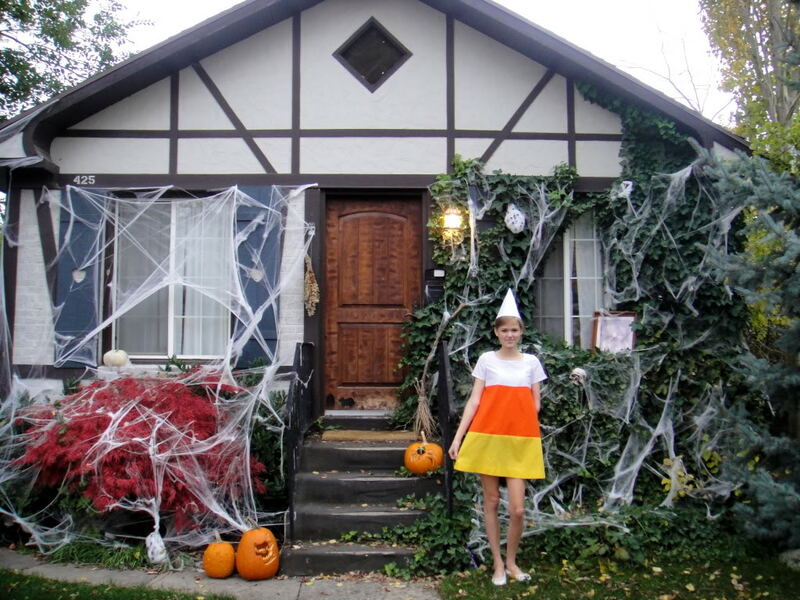 I made this costume last year.. but Halloween snuck up on me and I never made something new. 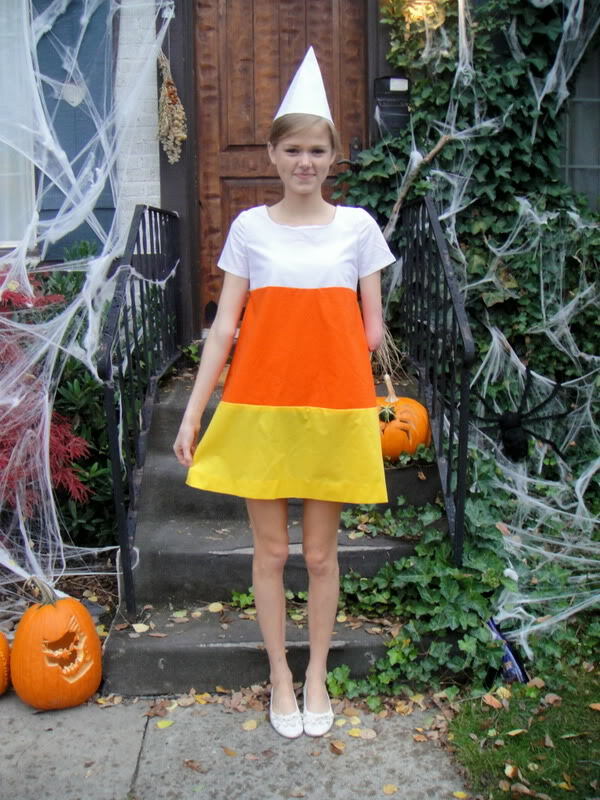 So round two candy corn it is! Now don't pull out the birth control on me just yet- I'm not married, nor am I crazy. But this is where nieces and nephews come in handy! The creative genius behind this idea was Dana from Made whose buttercream yellow version made my heart flutter. When I realized I'd be doing it without a pattern, I thought I was in waay over my head, but it turned out to not be so bad. All it took was some patience, a few stretch needles and voila! One cute little redhead. Shabby Apple is holding a design contest that I thought I'd take a chance at. Bare with me, I'm a novice at drawing. But if you know me well at all, you know that I can't not enter a contest. My first dress. 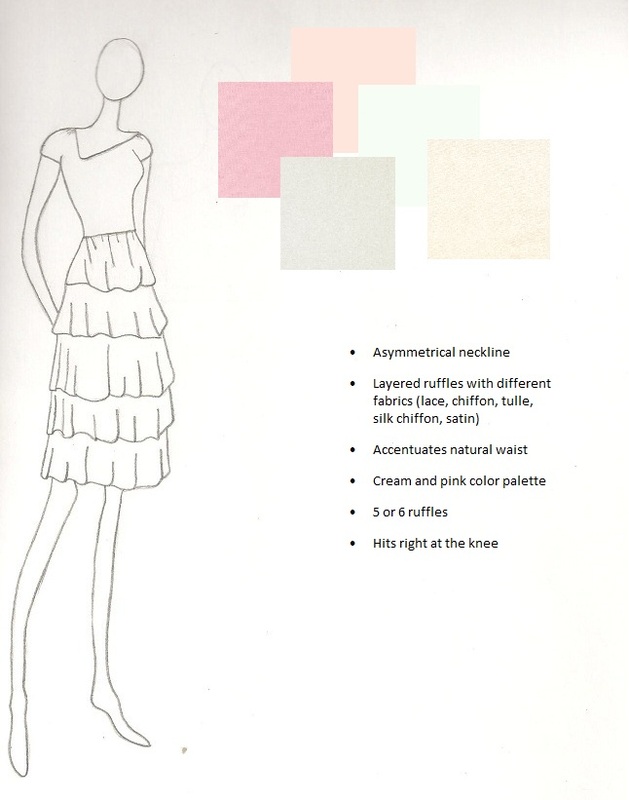 The fabric would be knit with a color block design palette. 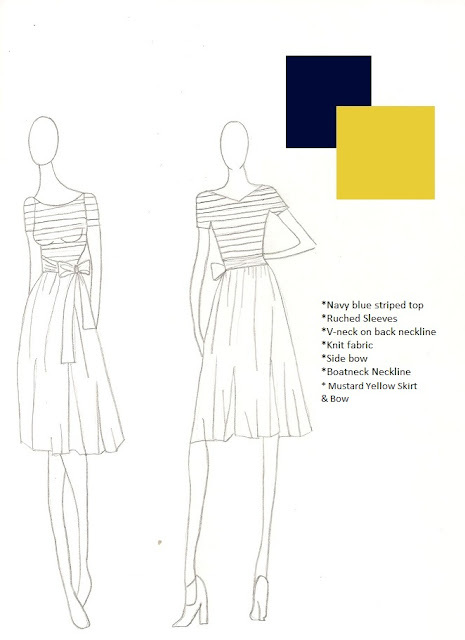 The skirt and bow would be either mustard yellow or gray. (Which color palette do you like better?) and the top would have navy blue stripes with ruched sleeves. The back neckline of the dress would have a slight V-neck, but not to low so it would still fit Shabby Apple's design standards. For my second dress, I kind of struggled with putting my design down on paper. The sketch isn't my favorite but hopefully my idea will still show through. I wanted the dress to be really feminine looking. I love the idea of texture so I pictured the ruffles to be made of all sorts of fabrics. (lace, chiffon or silk chiffon, tulle, and satin). 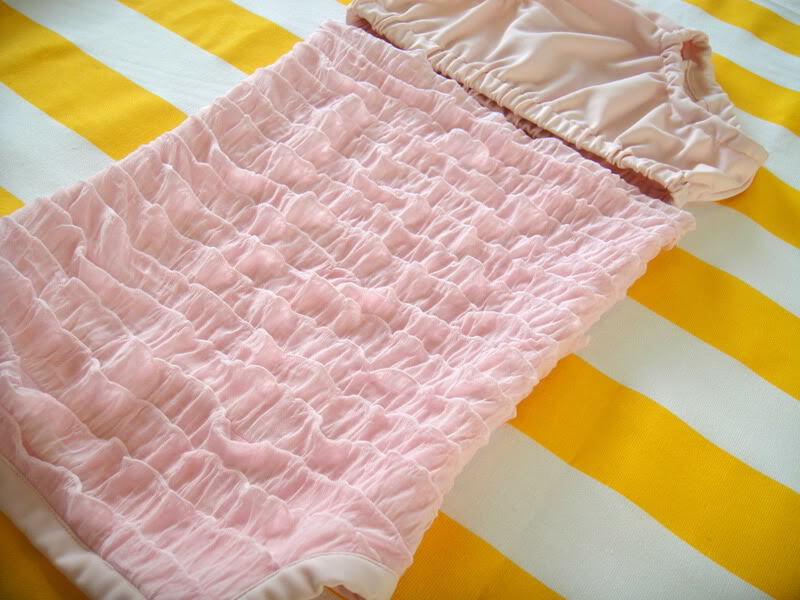 It would have 5 or 6 ruffles, each about 1 to 2 inches in length. This dress would gather a bit lower than the natural waist and the top would have an asymmetrical neckline. I'd want a stiffer fabric for the top as well, maybe cotton or polyester. Some sort of sturdier fabric to balance out the softness of the bottom. The colors would be creamy and soft. White, off-white, beige, cream, ivory and pale pink. This dress was inspired by a dance dress I wore last year. It's similar, but I wanted to leave out the things I didn't like about that dress and keep the things that I did. I wanted to go for more feminine colors instead of earthy tones and I wanted to make the top of the dress more interesting by adding an asymmetrical neckline. I also wanted to add all different kinds of fabric for the ruffles as compared to just cotton and lace. and I never want to do it again.. haha. I don't know if it's because I don't have as many fingers for all of the intricate details or what, but these were challenging to say the least. 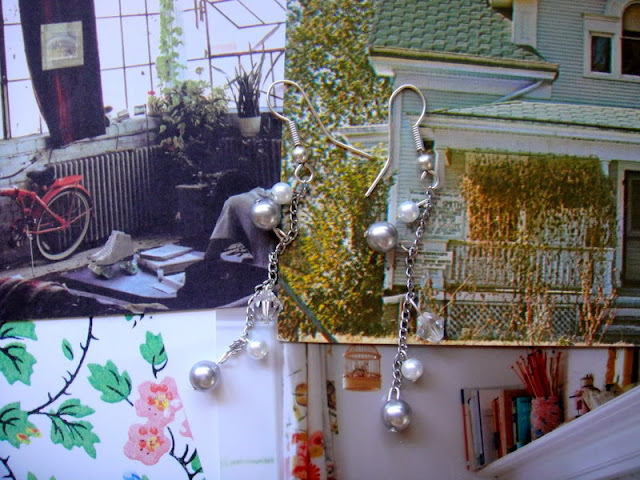 I think my jewelry making days are over. Oh well, that's what Anthropologie is for.